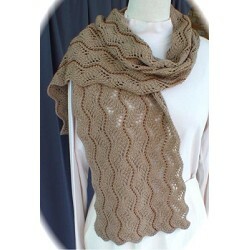 The second in a beaded lace scarf series, this wavy scarf design is accentuated with small beads for a subtle luminance. Yarn: 475 yards of fine yard - thin yet strong enough to support the beads. Beads: 1225 size 8/0 glass beads or other size beads that yarn will pass through.